With greased hands, it's kinda tricky to take photos, still managed to get some essential ones. These are sufficient for anyone to know what to expect from this DIY task. Two screws and the left switch-gear comes apart. 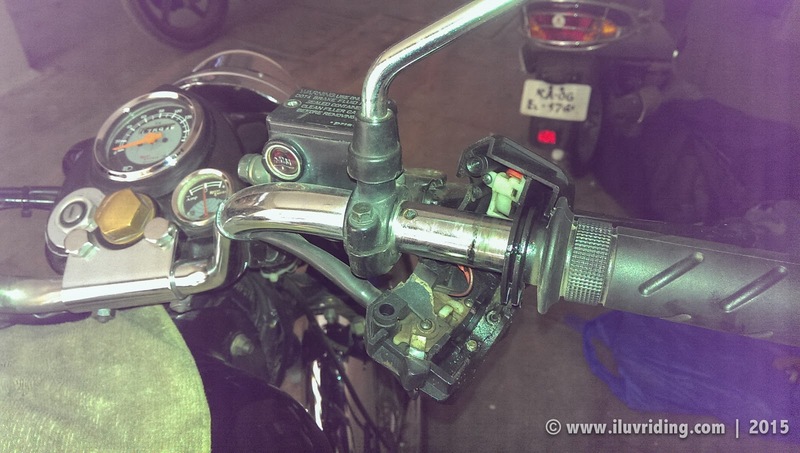 Notice the tiny hole on handlebar, a plastic from the switchgear fits there. It restricts it from rotating around the bar when switches are pushed. 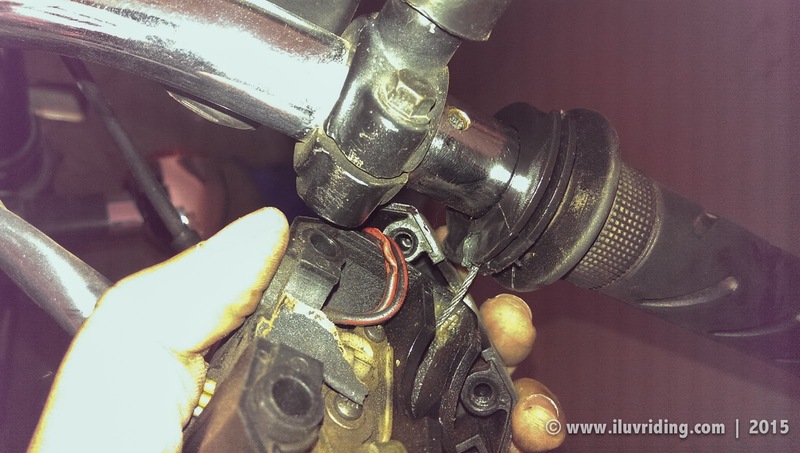 Loosen the adjustment tube at the end of clutch cable near handle bar and get the clutch cable out from it's groove. Bit tricky for first timers but have patience and don't damage the cable by any chance. 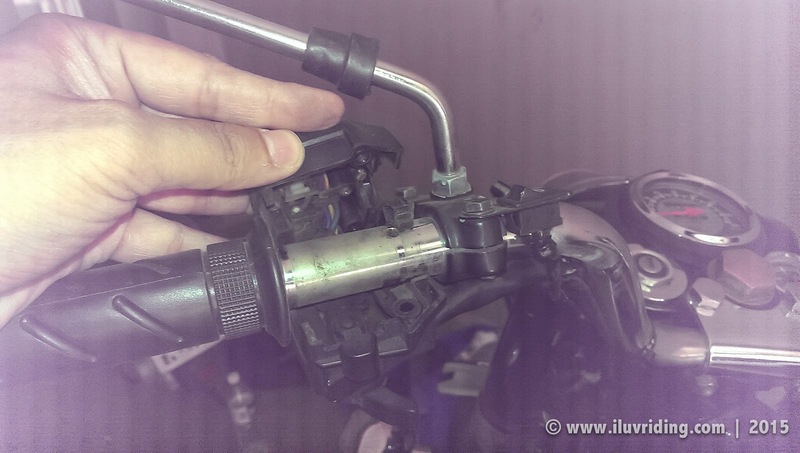 Carefully remove the throttle cable from the hand grip slot. I was lucky have a neighbour lend me his siz #17 spanner. This am gonna add to my tool kit now. 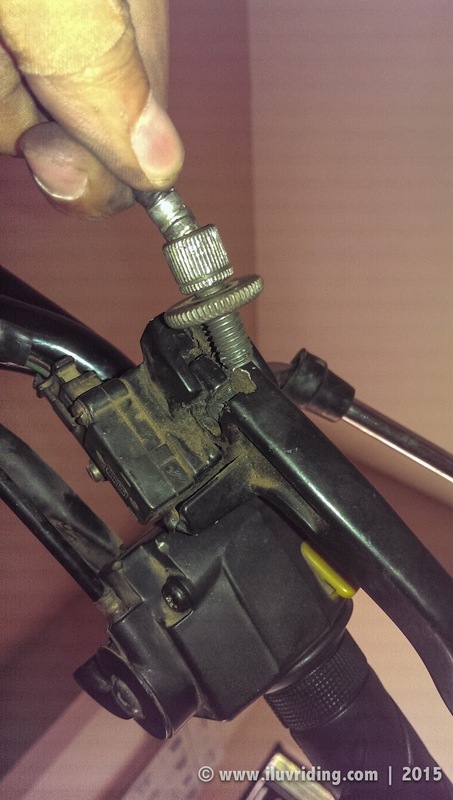 These two bolts below the handlebar would need size #14 spanners and fairly easy to take out or put in. 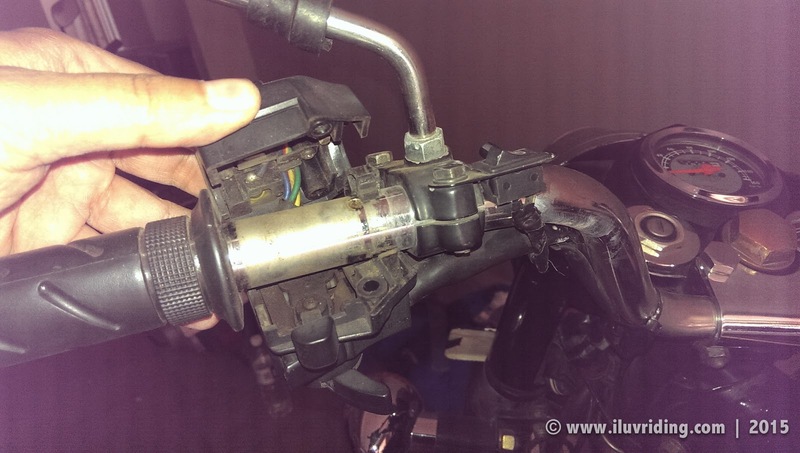 The groves which restricts the handlebar from rotating once tightened, are very faint on the RD350 black model. So I tried to use the saw blade from my Gerber to etch some lines. Later got some cut marks done by a mechanic on road side using a hammer and a chisel. Hope this holds up. 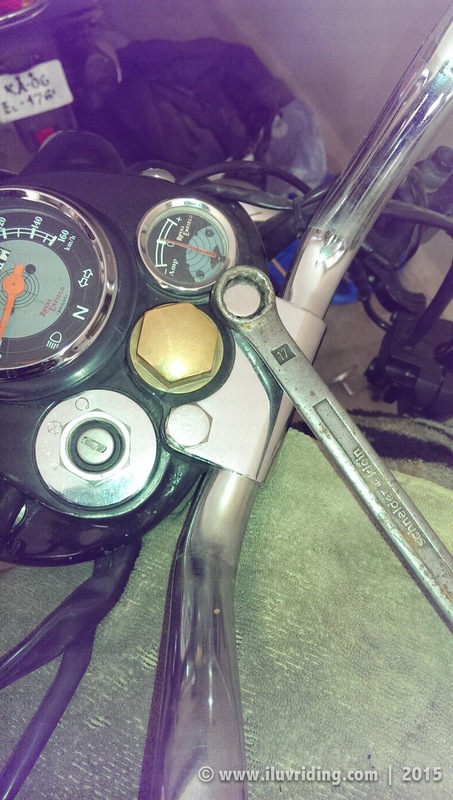 Before tightening all 4 screws, sit on the seat and adjust the bar to your preferred position. 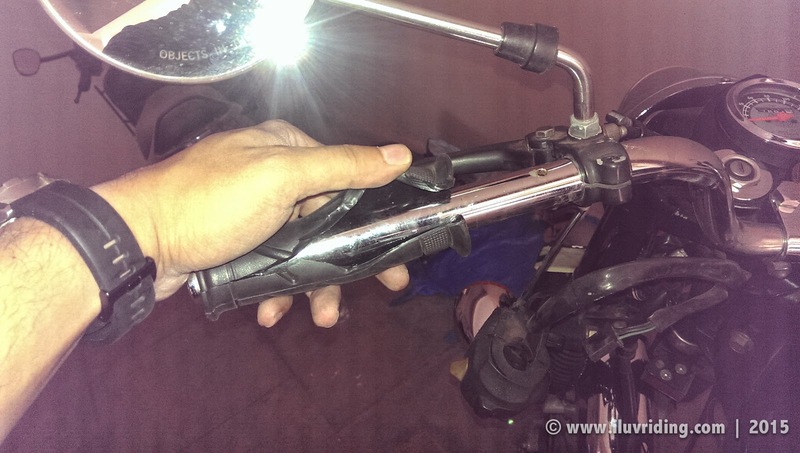 Slide in the mirror and clutch assembly before putting on the switch gear. Align the switch gear to stay exactly on the hole on the bar, the plastic bit should fit right inside. Test all the switch operations once. 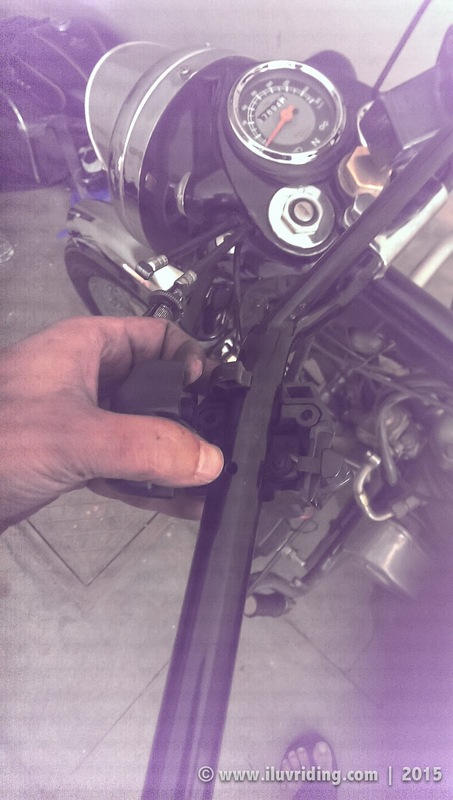 Note: I had to remove the fuel tank to get access to the cables, which were required to be pulled by 2-3 inches more to fit this new extended handlebar. First put the small drum into the grove and then use some force (and pull and release trick) to bring the clutch cable to it's path. The adjuster screw seen here needs to be slotted in and then screwed into the lever hinge. Totally it took 2-3 hours to complete this. I am yet to add the zip ties, as I don't have black ones with me. That would complete the setup. 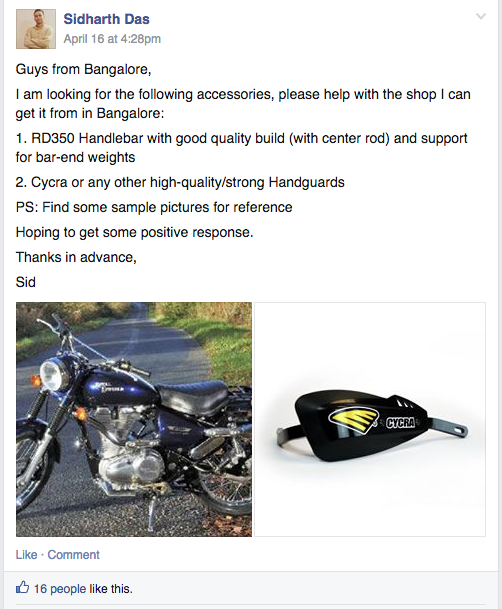 In case you have any queries on this post/steps, feel free to post it in comments. Confidence comes from experience, so get your hands dirty in things you like. So far I have been really pleased with the stock handlebar on my Electra 5s (CI). However, during my Leh tour, there were times when I felt the stress on my arms, mostly shoulders, and I faced difficulty in maneuvering my loaded bull on tricky mountain routes with stones and gravel. 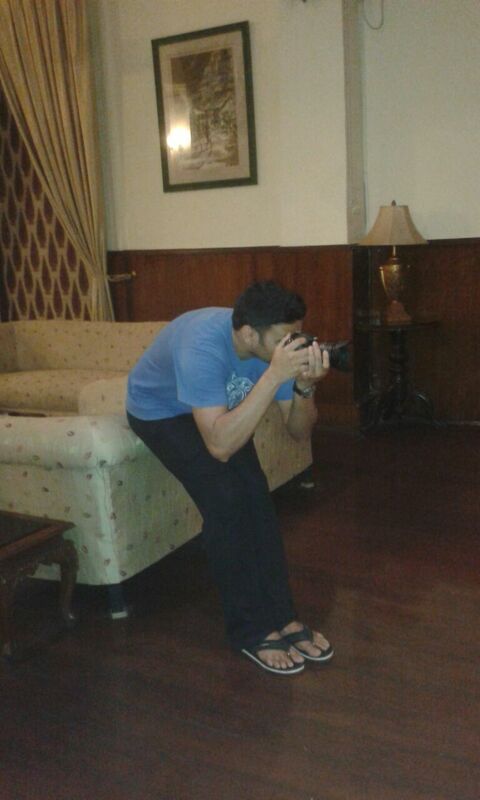 Though being 'fit n strong' (ahem!) helped me manage those patches, but definitely I wouldn't like to keep stressing my limbs every time I ride through such terrains. As they increase the possibility of an injury. As the trip provided tons of first hand experiences with pain being the least exciting of all, I almost forgot about it after coming back. 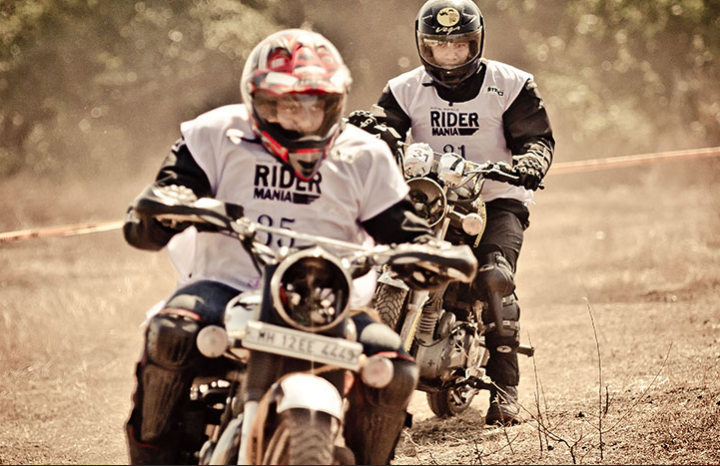 After my return last year in August, I have done some serious off-roading, during my ride to Mandalpatti Peak. Where me and a buddy took a cycling trail through the mountains. It was hell of a fun doing off-roading(post coming soon). 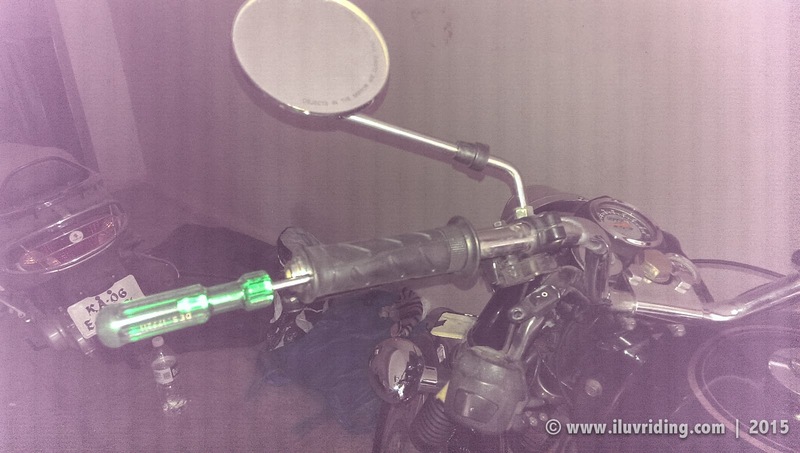 Only few days back I was checking online for some touring mods on my ride and all the mental notes I had taken during the Leh-trip came right back. 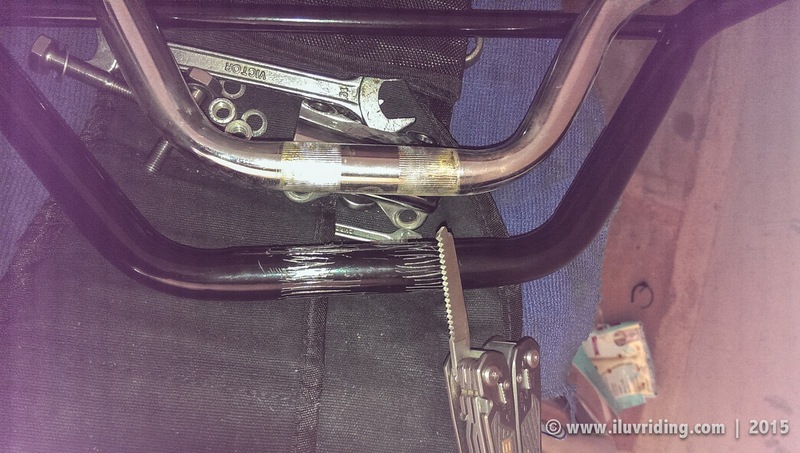 And here I am with my first mod project: 'The Best Touring handlebar for RE Electra'. So far the most comfy bars I have used were on the big Harley's (partly the comfort was due to the punchy torque and comfy/plush seating). 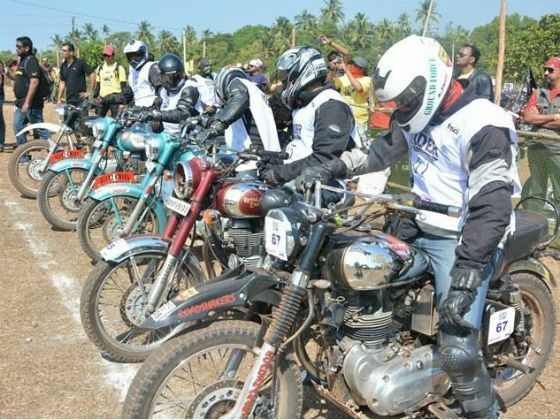 Among bulls, Thunderbird I believe has the most comfy handlebars as stock, as they keep your arms flexed at all time and hence adding no stress on long hours of highway cruising. BUT there is a catch, the cruising bars are not confidence inspiring for dirt/off-road/aggressive riding, as it provides a more pulled back seating posture. Which means, it does not give you that forward leaning stance, which off-road riding requires. 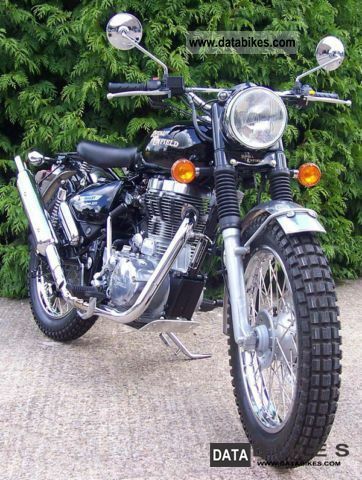 Now coming to the looks of those bars, they mostly go well with a laid back cruiser looking bikes like Thunderbird (or the mighty RE Lightning 535 of yesteryear). Electra however is a totally different deal. It comes as a retro looking, blank canvas and it inspires imagination in stock form. 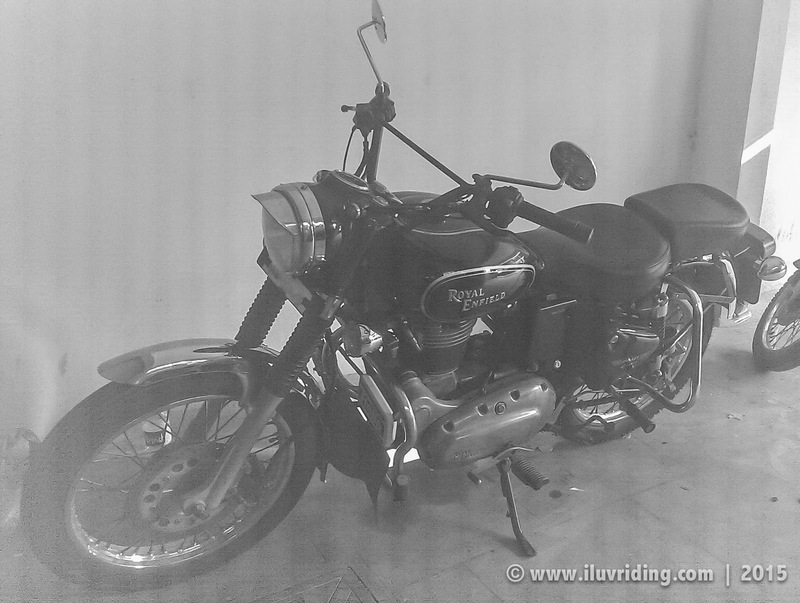 Actually the design is very basic and that is what excites buyers (mostly seasoned bikers), to think how they can customize and make it unique. It can be given any look based on your taste. So far I have kept mine looking like a chromed cruiser with bit of vintage look and feel with the stock handlebars. However now after my extensive off-road riding (which is what most of the Leh-Ladakh route can be termed as), I am very much looking forward to try out an enduro/rally setup on my bike. More on this setup in a later post. For now, lets stick to the project at hand. 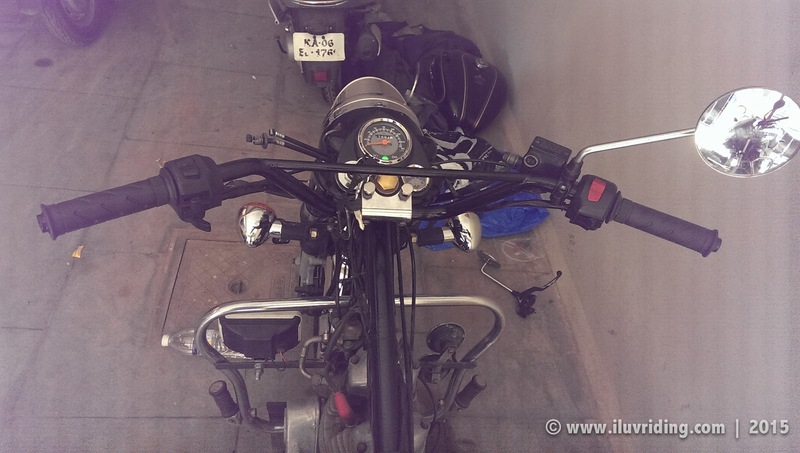 Now I did my search and reading around to know which would be the best handle bar for my needs (touring + off-roading) of the moment. 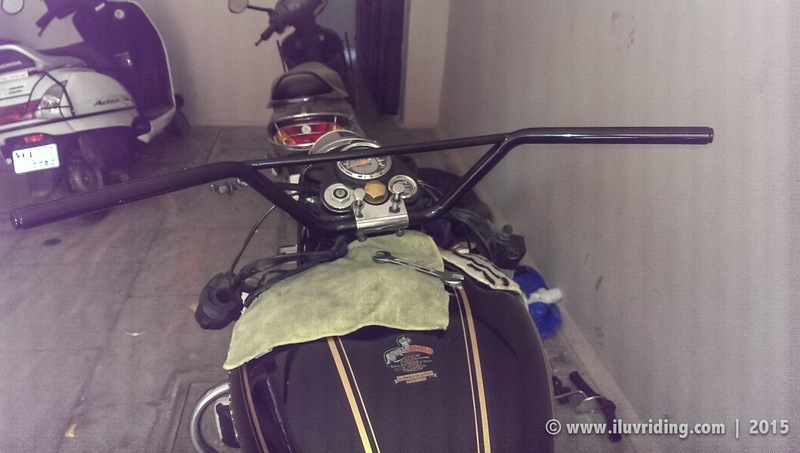 After digging around for few days, I could zero in on the 'RD350' handlebar with center rod. Its not the first time I am seeing or hearing about this particular design. Its been there since Enfields are being customized (which is like for ever!). 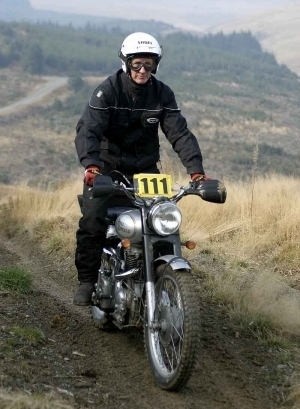 But what convinced me for this one is the fact that, its the most commonly used handlebar on all rally/trail enfields, without exception. DISCLAIMER: Images below are not mine and owned by their respective owners. I have used them here for reference only. I could guess the reason why. 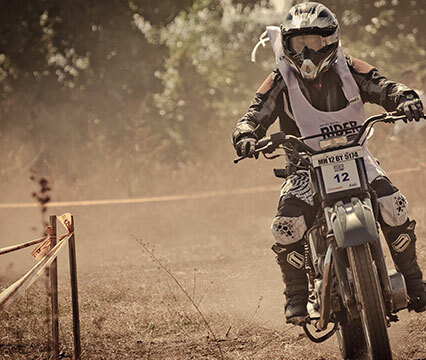 On mud/dirt/gravel this gives that upright stance to maneuver this heavy bike. 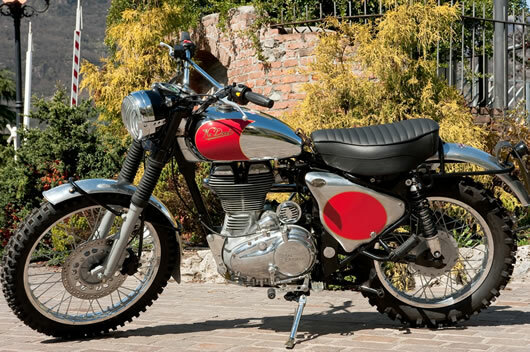 And the center rod along with the bar-end weights takes care of the characteristic vibes generated by the bull. This bar I could feel is taller and a bit* wider than the stock handlebar, which will make cruising a bit more enjoyable am sure. Well these all are my expectations, based on my experience with similar handlebars. After riding for a while with this new set, I will definitely post an update. 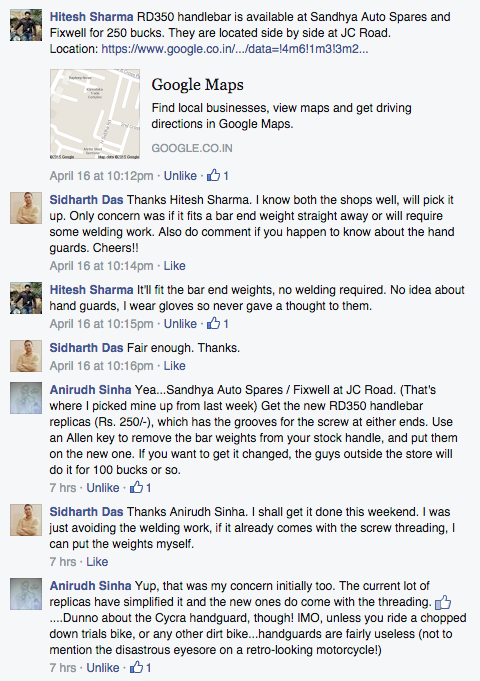 For this mod, instead of me going out hunting for the accessories, I posted a query in one of the RE pages on fb. Though I wasn't expecting much, but some people like Jijo, Hitesh and Anirudh came forward with suggestions and their experience with the bars etc, which turned out to be very informative. If you guys reading this post, a big 'Thank you'. Keeping a copy of thread in case you are walking the same path while modding your steed. 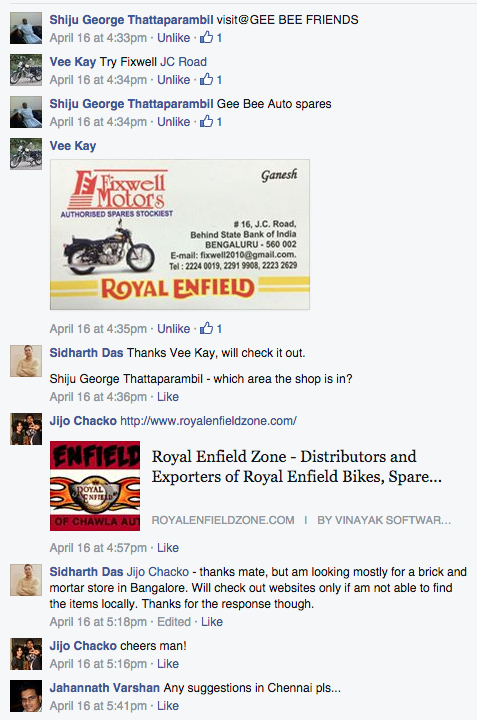 Initially I thought of visiting JC road with the bike and getting the job (purchase and fitting) done there. Then I got free from work a bit late and didn't had time to drop my car and pick the bike to visit JC road. 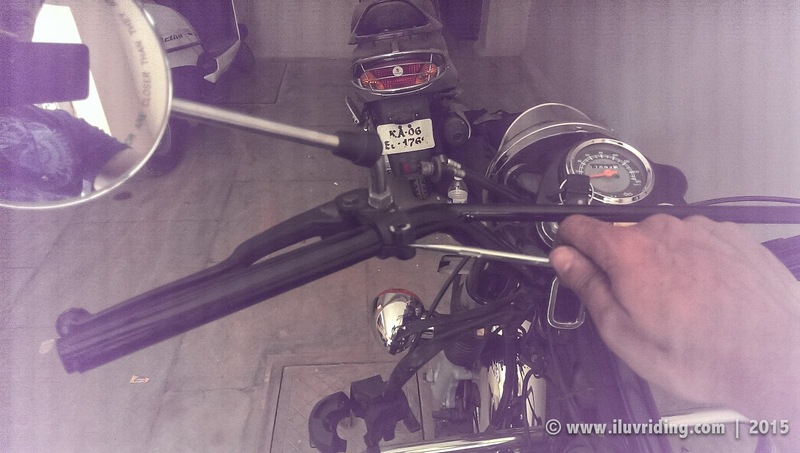 So directly drove there and picked up a mint looking RD350 rally-type handlebar with center rod and end threaded holes (to fit bar-end weights) for 280 bucks. Seeing the (perceived) quality of build of this bar, I would say I am impressed. It feels sturdier than I had expected and fit and finish looks good. Have a look for yourself. Morning I will get to it and if possible will try recording the process and 'gotcha's and will post the updates here. So stay tuned!! Due to this newfound agility and effortless maneuvering, I think I was riding a bit faster than usual and kinda aggressively (compared to my usual riding style). I am sure this is more due to the excitement of the new setup and will mild down as I get back to riding more. I think a long trip would help me in evaluating the new setup in detail. Will try and update that when it happens. 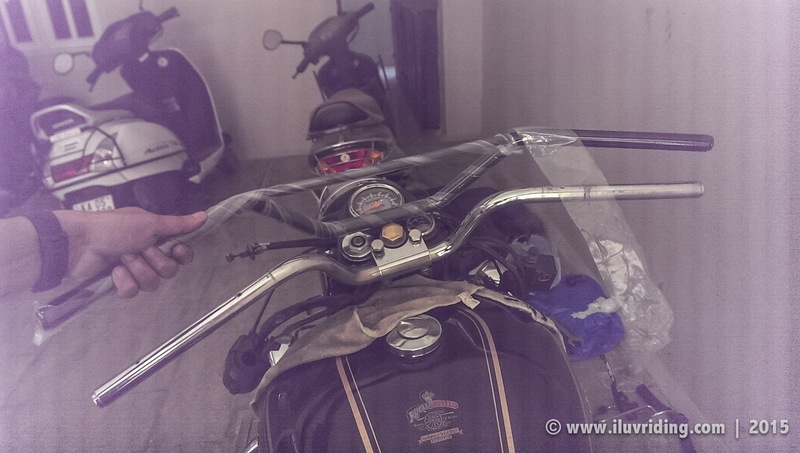 Update [05/05/2015] : Completed a 1200 KMs trip through Tamilnadu and Kerala and could confirm the new handlebar is a gem. Lots of ghat section riding too and really happy with the way the motorcycle handles now with the new setup. 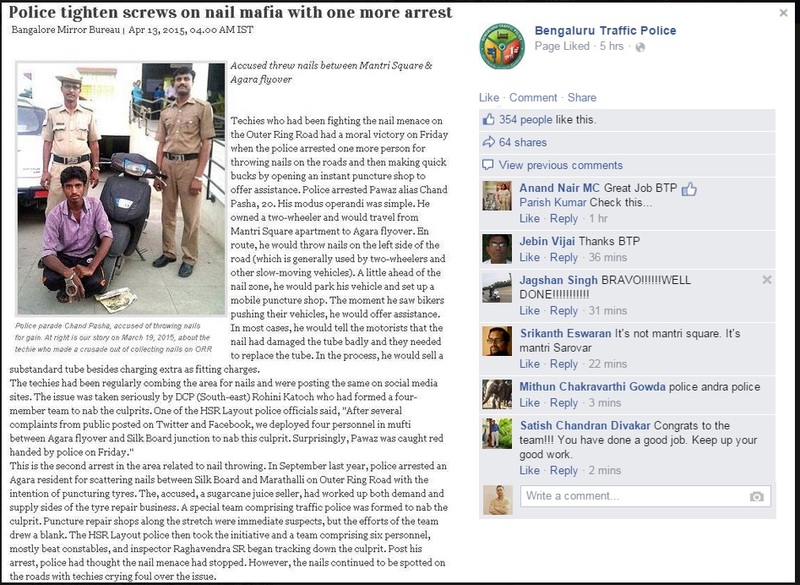 'Nail Mafia' - say what now ?? Now this incident made me realise that most of the people whom I met and were interested in touring on motorcycle, shared one common concern. Which is "what if the bike (tyres) gets punctured?". Now if you have already gone through this phase of worrying about punctures (like me), it might sound a bit silly. However when I recall my initial days with tripping on motorcycles, I too always stayed within city limits, just for this reason. So I can totally empathise with the newbie riders here. 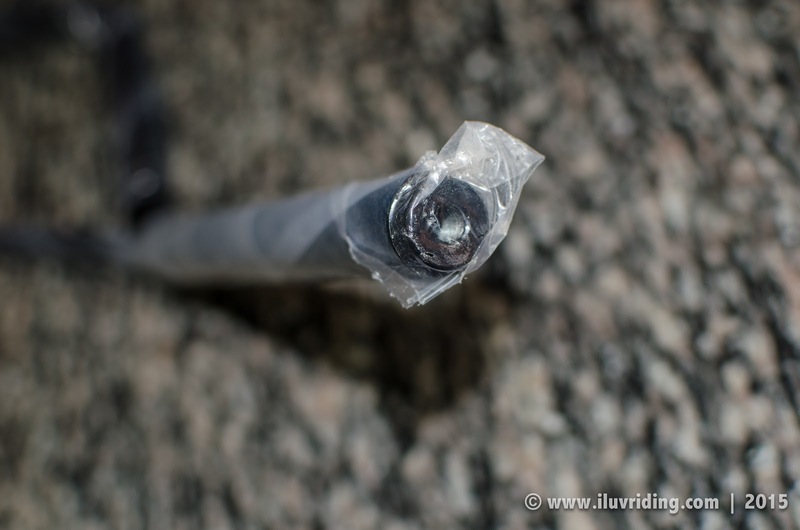 So lets delve into this topic and I will share some advice (which may not be the best advice ever, but have worked for me), on what to do during a puncture scenario. 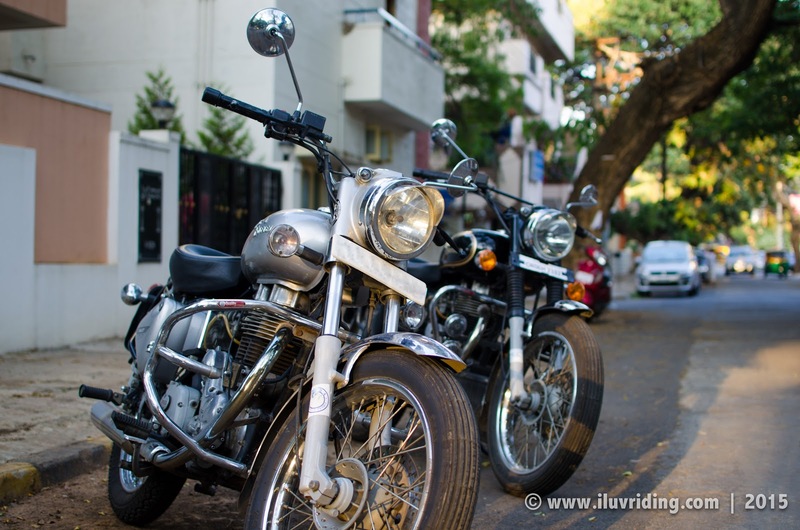 For those of you, wanting to get rid of your fear of a flat tyre, read on..
Now having ridden enough distance on motorcycles, I can tell you, puncture is not something you should be worried about too much. In case of a puncture if you could afford the time and tools and have a spare tube (recommended), you will be back on your way in no time. Someone has rightly said, "Prevention is the best possible cure". So lets take quick look at few simple things which are responsible for punctures, like stopping at the side of the road. I hope above points are more than enough to make you be watchful and a tad bit extra careful while pulling over. Now as you are smarter now to avoid common mistakes which usually causes a puncture, you are reducing your chances of facing one. BUT just in case, if and when you do face one, following information will come in handy. 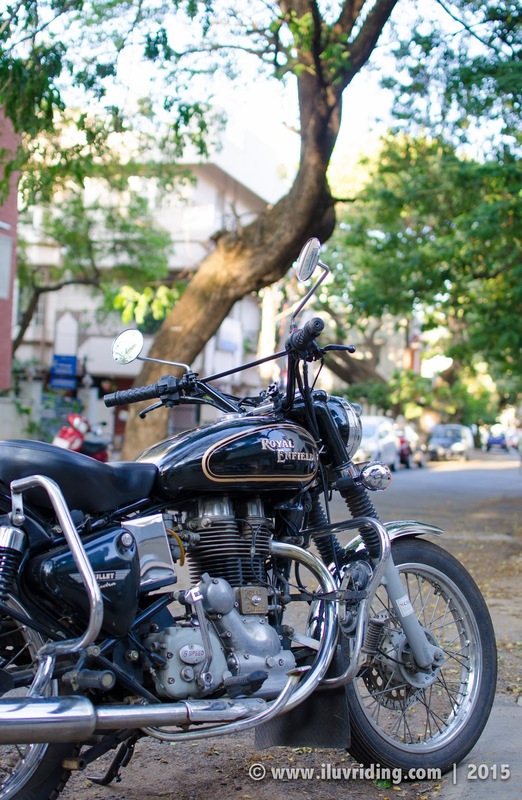 If you are on a roll as it happens, have a quick glance at your rear-view mirrors (especially to your left), switch on your left blinkers and slowly steer your bike towards the left edge of the road and come to a slow rolling halt. 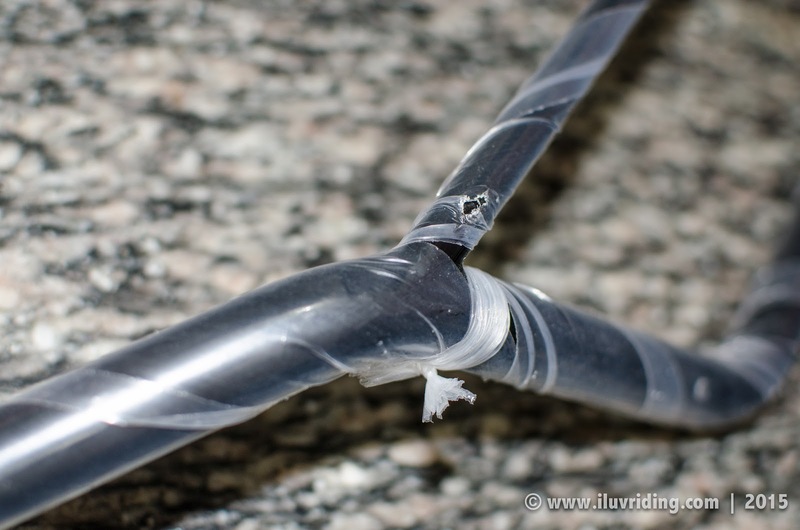 NOTE: When tubes are punctured, they lose air slowly enough for you to feel a wobble. So the sooner you realise and initiate your exit to the side of the road, the safer it is. Take a deep breath and accept that you have a flat tyre. Yes, it will take some time now and will possibly delay your ride schedule by 1-2 hours, so better accept this and stop cursing your fate/the road/your stars/etc. Doing this will help you stay calm and relaxed and you will make less mistakes in the following steps. 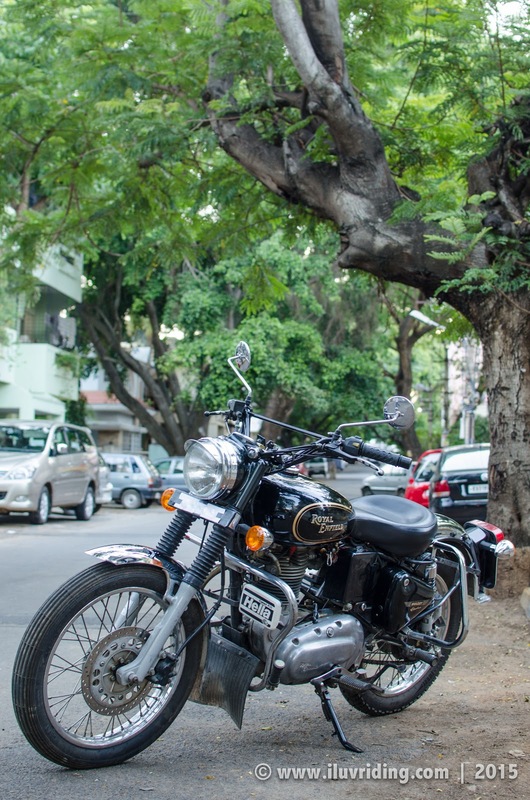 Push the bike to a safe place on the road side away from any moving traffic, possibly to some shade where you can work peacefully on the bike. 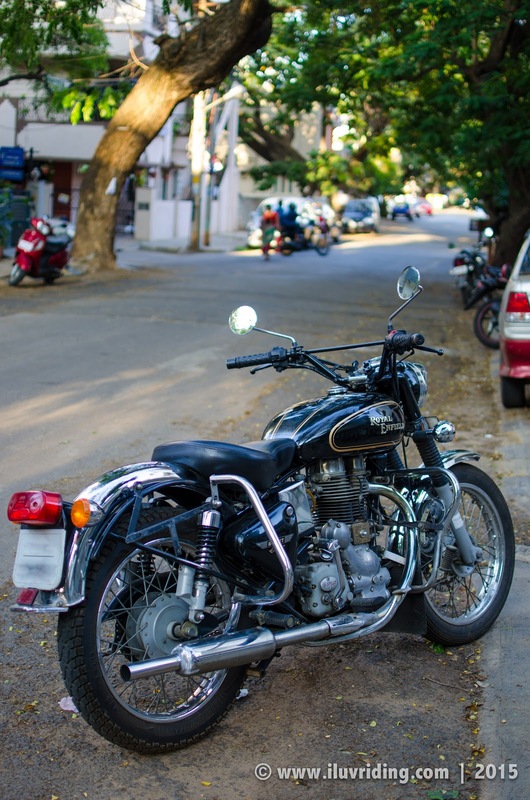 Take off the helmet and gloves (and jacket if it is summer) and keep it safely/securely on the handlebar (if you are to remove your rear wheel) or on the passenger seat (if you need to remove the front wheel). 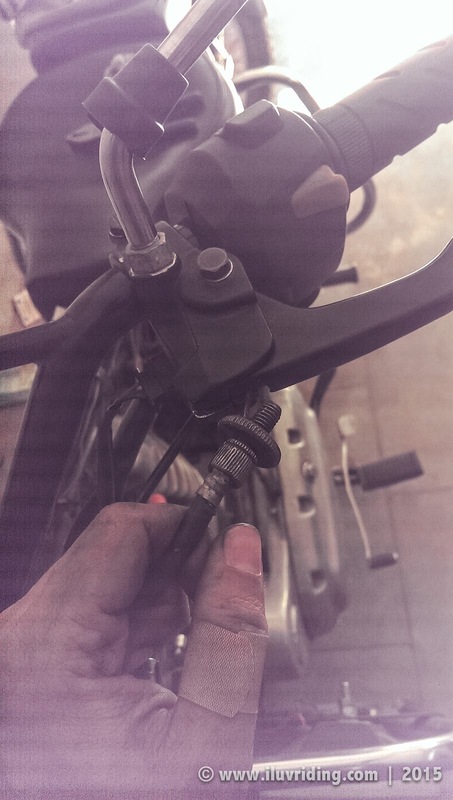 1) this will help add some weight to keep the side of the bike floating, once the wheel is removed and 2) in India if you are riding in summer, by wearing all the insulated gear, you might dehydrate while trying to fix your wheel because of the heat and exhaustion. 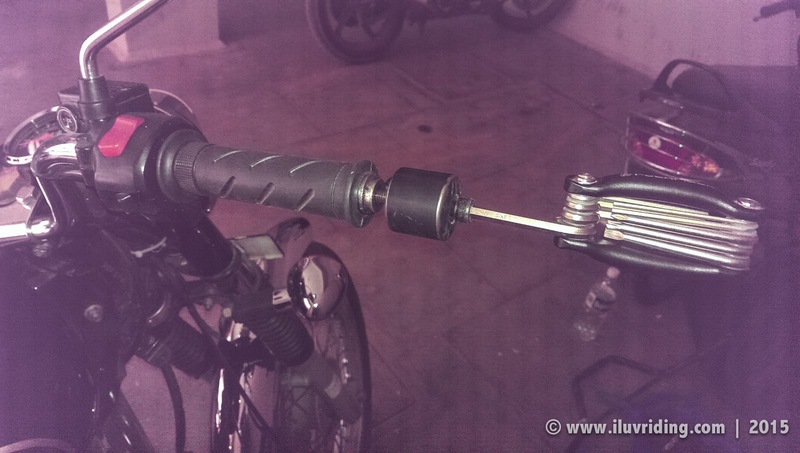 Take the tools out which will help you to remove the wheel and tube. Take out the spare tube and keep it handy. Do not ride a bike when its punctured : (unless its the only option left for you due to some unknown reason) - Riding a bike with a deflated Tyre will not only damage the tube, it will damage the tyre as well as the wheel (/rim). 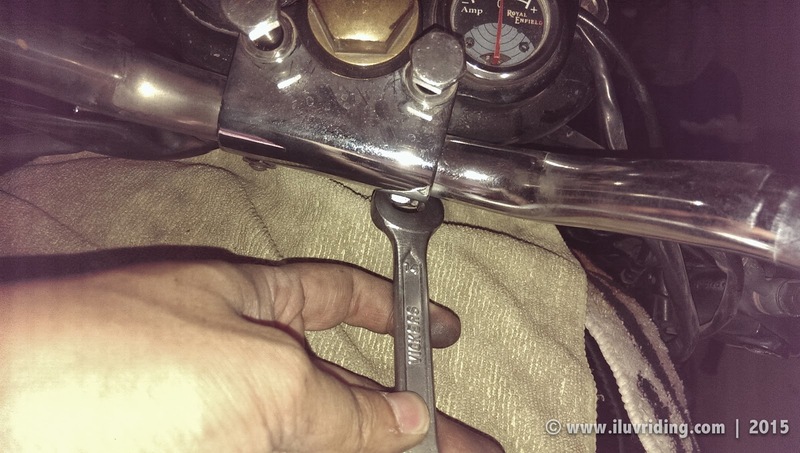 Use tyre rods to break the bead of the tyre : Do this step very carefully and avoid using screwdriver for this work as the sharp side often times damages the tube further. 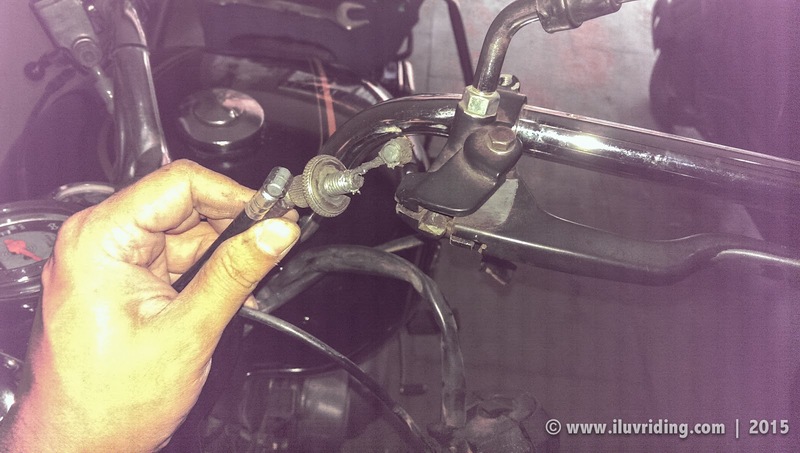 Once the tyre is off the rim on one side, reach out for the valve stem and take it out from one side : Then work your way around the whole tube from underneath the tyre until its completely out. Still you think you can't do something?!! Yeah, so the benefits really outweighed my possible complains of not able to ride my bike. I am really happy looking back at the things I faced and learned. Now pushing myself to the next level of things. Getting back to jogging and gymming is next on my agenda and am currently building myself up for it. Not sure how much time it will take though, but am perfectly fine taking it slow, as long as am improving. Wish me luck. 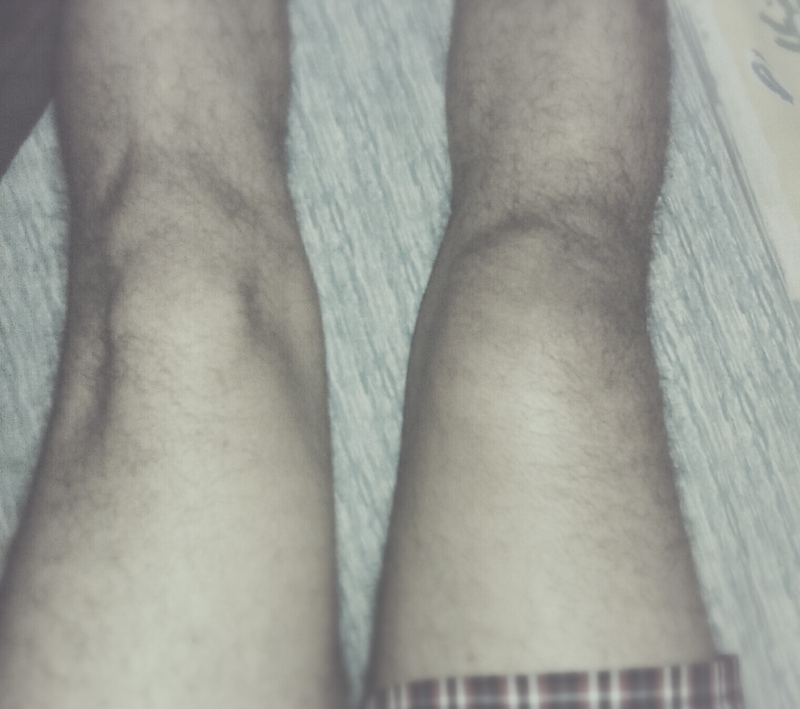 Few days after the injury and this is as far as I can fold my right knee..
A day after the injury. Here the swelling has actually reduced a bit. 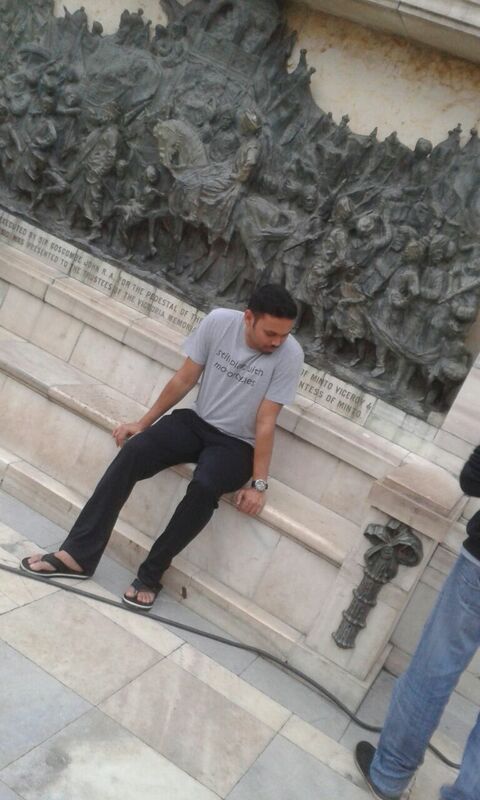 @ Victoria Memorial Hall, this was the only trouser which could hide the knee bandage inside. 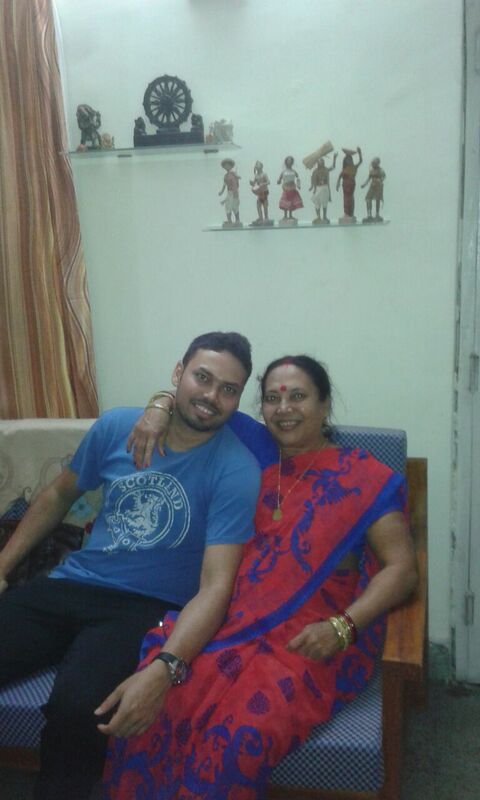 After the initial scolding about my love for motorcycling, mom was happy to have me around the house with her:) Being at home wasn't so bad after all. At Bhubaneswar airport after a restful (*pun intended) vacation, leaving for Bangalore..
Hope this post inspires you to overcome your personal challenges, both stronger and better in every possible way.